Finally! Another RPG title for the XBox 360 that will please most fans of the genre in this epic struggle of good versus evil. Unlike traditional RPG titles, the gamer is encouraged to test the boundaries of their alignment which allows them to solve the puzzles and quests in the game in a variety of different and entertaining ways. Spectacular and dynamically choreographed fights. The combat system combines intuitive steering, tactical challenges and movie-like visual experiences. Animals to be ridden on. 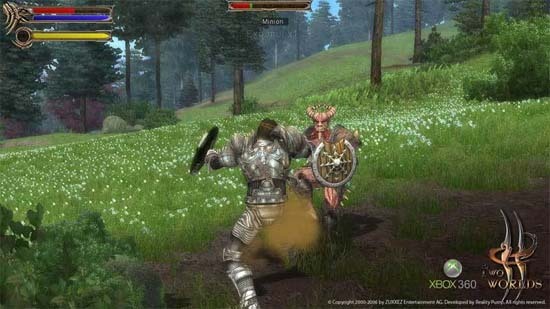 Players can travel and fight on various animals from horses to tamed lizards and beasts. A choice of traps and snares are at the Player's disposal making the gameplay both rich and flexible. Huge variety of items to be found. Randomly generated pieces of equipment, thematic sets and combined items offer the space to experiment and satisfy the need to collect. Wide range of beautifully rendered terrains: from high mountains to seashores and deep caves with all of the locations featuring ultra sharp texturing and stunning design. Hyper-realistic tree physics and sophisticated weather system make the world come to life as has never been seen before. The story of Two Worlds revolves around your character (named at the players discretion) who is desperately searching for his abducted sister, however unfortunately for our valiant hero or dastardly villain, he is embroiled in a world that teeters on the edge of war as humans battles orcs. To compound the situation for the race of man, the Orcs have discovered an ancient artifact that will not only change the tides of war but also summon an ancient god long forgotten. As you become embroiled within this clichéd yet RPG-esq storyline, your character has the power to influence his planets history. Clichéd but a must needed RPG title since Oblivion hit the 360 those so many many months ago. 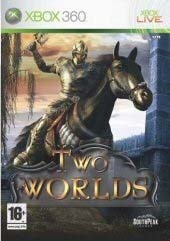 In its essence, Two Worlds is your traditional RPG title where the player has the ability to create their own powerful heroes or villains by destroying enemies and completing quests. As per RPG number 120, items can be collected from the dead and even sold to shop keeps to make a quick coin or two. Weapons and items are also available at these stores and are littered throughout the gaming environments for those that enjoy searching. A really impressive feature of Two Worlds if the ability to create new weaponry by merging similar weaponry together to create new and improved versions. Classes in Two Worlds can also be changed and suited to the gamers personal interests, tastes and needless to say if it isn't broke, don't fix it which is a true analogy for the Two Worlds RPG system. Combat is another entertaining aspect of the title which is reminiscent of Oblivion on the 360 as you hack and blast your way through a plethora of nefarious enemies. The strange thing about Two Worlds is the artificial intelligence in the title that ranges from good to sometimes mediocre, especially when you run past them and they don't take pursuit. When fighting an opponent, the system is quite sturdy and most gamers will get simple satisfaction dispatching their enemies. 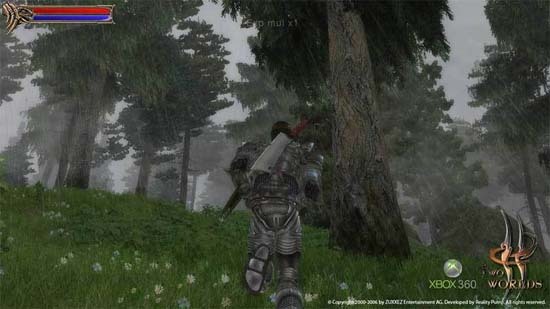 Graphically, the game is a visual treat with enormous gaming environments, however when the action heats up, the frame-rate unfortunately drops. Another issue with the title is the sometimes extremely long load times which does become a tad frustrating as your character explores the gaming environment. I'm still amazed at how impressive the background environments are of Two Worlds and match that with some realistic character animations and high resolution texture details and you have a decent looking game. The soundtrack of Two Worlds features your traditional RPG soundtrack that suits the genre perfect with its chants and highly detailed musical scores which heats up when the action commences. Add in a variety of realistic sound effects and voice acting and you have everything you need to enter this amazing universe. In conclusion, Two Worlds will take the average gamer around 15 hours to successfully complete and once this has been completed, why not try for some online multiplayer fun that allows for PVP and co-operative games. 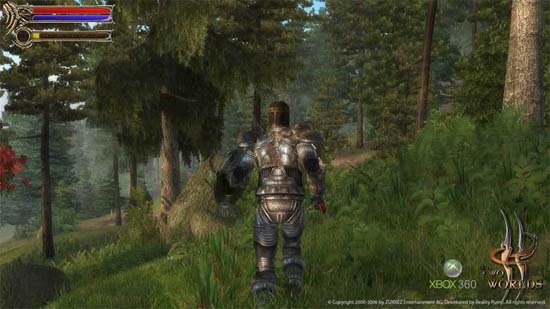 The game features a sturdy gaming engine with amazing background environments and brilliant graphics that we could easily recommend to lovers of the genre. Sure, it's not Oblivion but it's still one entertaining title which is easy to get lost in.